Top : The emission dispersion relation from differnet portions of Tamm 0D structure coupled with a layer of colloidal nanocrystals ; Buttom : Measured emission polarization (left), emission pattern (right) from a single nanoplatelet deposited on a gold substrate. 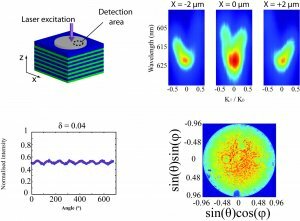 This PhD work considers the coupling between fluorescent emitters (colloidal semiconductor nanostructures) and their optical environment. It consists of two parts : in the first one, photonic structures (optical Tamm states) are characterized through the fluorescence of nanocrystals inserted inside these structures. In the second part, individual CdSe/CdS nanoplatelets are characterized by microphotoluminescence on various substrates. In both studies, the measure of the radiation pattern by Fourier plane imaging is an important element and its principle will be detailed. Optical Tamm states are electromagnetic states confined at the interface between a Bragg mirror and a metallic surface. We coupled a layer of colloidal CdSe/CdS nanocrystals with 2D and 0D optical Tamm structure. The lateral confinement effects in the 0D case were evidenced. We have studied the emission dispersion relation from different portions of the optical Tamm structure and compare these results with numerical simulations. Finally, by exciting different positions in the nanocrystals layer, we demonstrated that the emission direction is highly dependent on the position of the source inside the structure. In the last part of the presentation, we establish a precise method to determine the emission nature (1D or 2D dipole) and orientation of a single nano-emitter. The main idea of the method is to measure the radiation pattern and emission polarization from a single emitter simultaneously. For an appropriate substrate (gold or glass), these measurements can provide very different results depending on the 1D or 2D nature of the dipole, so that we can determine whether the emitter is 1D or 2D. This method is applied to the study of colloidal CdSe/CdS nanoplatelets (20x20x2 nm). Perfect agreement between the theoretical calculations and experimental measurements confirms that the emission from square nanoplatelets can be well described by a 2D dipole oriented along the plane of the platelet. Studies on rectangular nanoplatelets show an asymmetry of the emitting dipole. 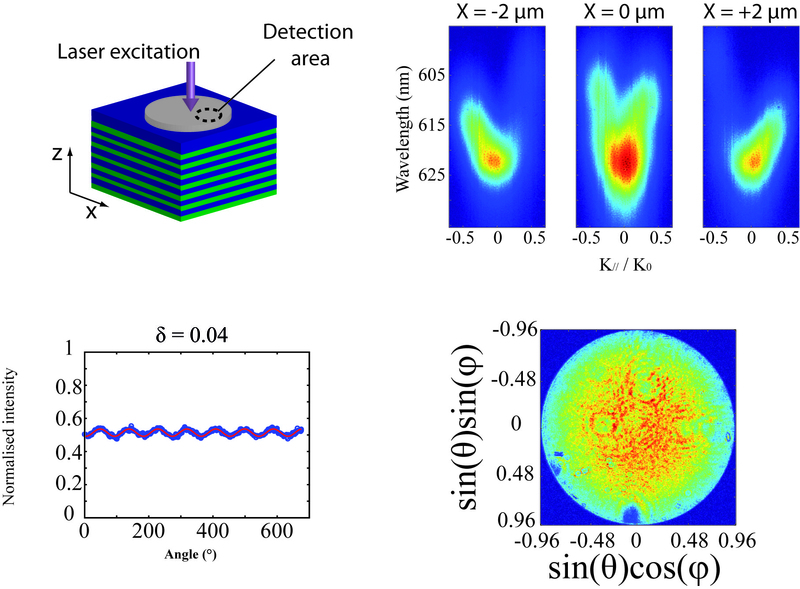 This study shows the influence of the shape of the platelet on its emission dipole, which could be explained by a dielectric antenna effect.